(video)--A 27-year-old man died in a vehicle crash Thursday near Custer, bringing the total number of fatal crashes during the Sturgis Motorcycle Rally to six. The Highway Patrol released the latest numbers as part of its Rally Tally on Friday. The latest fatal crash occurred at 7:12 a.m. Thursday seven miles west of Custer. The Highway Patrol says a 2016 Volkswagen Tiguan was eastbound when the driver lost control and the vehicle went into the ditch. The 27-year-old male driver was pronounced dead at the scene. One of three other occupants, a 20-year-old male, sustained life-threatening injuries. The other two passengers, a 21-year-old male and an 18-year-old female, both received serious non-life threatening injuries. 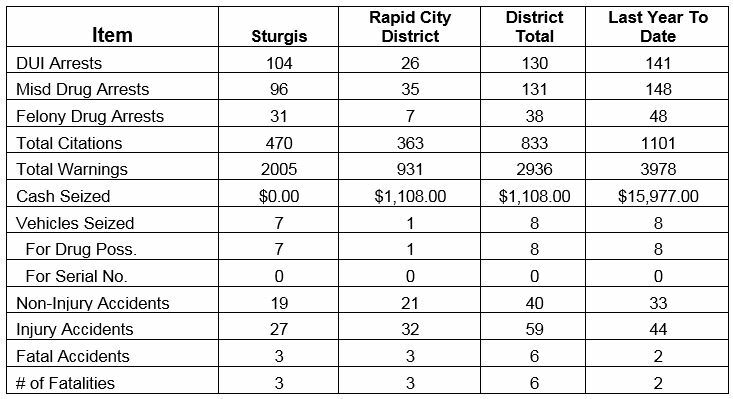 In other Sturgis Rally figures, authorities have made 130 arrests on DUI, 131 misdemeanor drug arrests and 38 felony drug arrests. There have been 40 non-injury accidents and 59 injury accidents reported. At 7:40 a.m., South Dakota Highway 34, mile marker 48: A motorcycle was eastbound on South Dakota Highway 34 when it hit a deer that had entered the roadway. The male driver, 67, from St. Paul, MN, received serious non-life threatening injuries. He was wearing a helmet. At 9:34 a.m., U.S. Highway 85 at Colorado Boulevard in Spearfish: A Mazda was northbound on U.S. Highway 85 when a motorcycle entered the roadway from the left and the two vehicles collided. The male driver of the vehicle, 76, from Deadwood, was not injured. He was wearing a seatbelt. The 71-year-old male driver of the motorcycle from Baker City, OR, sustained minor injuries. He was wearing a helmet. At 12:47 p.m., Interstate 90, mile marker 111, one mile east of Wall: A motorcycle pulling a trailer was eastbound on Interstate 90 when the driver lost control. The 67-year-old male driver from Dubuque, IA was thrown from his motorcycle. He was not wearing a helmet and suffered serious non-life threatening injuries. At 1:35 p.m., South Dakota Highway 87, mile marker 75, eight miles east of Custer: A motorcycle was southbound on South Dakota Highway 87 when the driver entered a curve and the male driver lost control. He was thrown from the motorcycle. The driver, 67, from Ft. Lauderdale, FL, suffered serious non-life threatening injuries. He was not wearing a helmet. At 3:03 p.m., South Dakota Highway 87, mile marker 54, 10 miles southeast of Custer: A motorcycle was southbound on South Dakota Highway 87 when the male driver lost control of the motorcycle, which went off the roadway and down an embankment. He was thrown from the motorcycle. The driver, 58, from Minot, ND, sustained minor injuries. A female passenger, 49, from Bakersfield, CA sustained minor injuries. At 3:43 p.m., Wildlife Loop Road, 11 miles east of Custer: A motorcycle westbound on Wildlife Loop Road was traveling around a curve when the male driver lost control. The driver, 66, from Hugo, MN, suffered minor injuries. He was not wearing a helmet. At 4 p.m., U.S. Highway 85, Spearfish: A motorcycle was northbound on U.S. Highway 85 when it hit an oil slick on the roadway. The male driver laid the motorcycle down on its side. The driver, 34, from Ronald, WA, suffered minor injuries. He was not wearing a helmet.